George Soros is probably one of the most dangerous human beings on the planet. He has brought down economies and has caused his share of revolutions, and now has his sights on the United States of America. George Soros’s plan is to help achieve a “New World Order” or “NWO”. His power has touched over 60 countries using his “Open Society Institute” which is said to spend some $600 million per year to advance his agenda. The International Banksters are the other side to this coin. They want the same things, but are just more quite about it. Their goals are for a “One World Currency” and a “New World Order”. George Soros’ agenda include European style socialism, population control, and the famous “Green Agenda” which has generated much corruption around the world starting with the “Global Warming” myth. The “Carbon Credit” fraud is all part of this garbage as well. He recruited Al Gore into this fraud in which big Al Gore generated millions for himself, cheating and conning anybody that would listen. George Soros’ “Big Brother” one world government, will undoubtedly ruin the United States of America by completely bypassing the United States Constitution; killing any chance of remaining under the freedoms that our original forefathers fought for. The Banking Elite and George Soros are both members of the Council on Foreign Relations and the Trilateral Commission also known as the Bilderberg Group. Two organizations scheming to manufacture the “One World Order”, the “One World Government” and the “One World Currency”. Currently, Soros is trying to figure out how to achieve “an orderly decline” of the US dollar, important to introducing a “New World Currency” the important step for the “ New World Order”. I suggest that all Patriotic Americans, who believe in the Constitution of the United States, and want to remain under the articles that are forefathers fought for some 235 years ago, study up on George Soros, and understand how dangerous this man really is, and how his ties to the International Banksters correlate with each other. You will start to understand the evil that America is up against. The only way to beat this scourge is to fight and I mean the kind of fight that our forefathers had to do to achieve our freedoms, the only kind of fight that our enemy’s will understand. We must stand together or we are finished. We all wonder how this man came to be without anyone recognizing what he was doing. How did he manage to get under the radar of our congressmen and american leaders ? UNDER the radar??? He didn’t get under the radar, he bought them off, plain and simple. These “leaders” you speak of are and have been for sale to the highest bidder from the moment they were encouraged to run for office. It’s all quite simple really; you accept the help (i.e. money) from these people to get elected. Once there, you owe your loyalty to the people who put you there. It builds from there, every time you help them, they come back for something more. If you decide that you aren’t going to help them anymore, you’re turned out of office and some other schmuck wins the next election. This is why all politicians cannot be trusted. They have all been bought to some extent, and it matters not whether they are running under the Republican or Democrat heading, they are all crooks and they have already agreed to sell us out by the time we even hear about them preparing to run for office. This applies equally in all levels of government, local, state, and federal. If you don’t know this you are incredibly naive. Welcome to the real world of American politics. WHERE IS 007 JAMES BOND now that we need him? Watching. Waiting for the “kill”. HE IS THE PERSONIFICATION OF EVIL!! GET RID OF HIM… CANT HE GO LIVE IN ANARTICA?? YIKES!! JUST LOOKING AT HIM MAKES ME VOMIT!! I bet he isn’t even Jewish and isn’t a billionaire. He is probably a Russian spy whose money comes from Russia. Why haven’t the good guys in the CIA could terminated him? Why not? They terminate lots of people so terminating him should be easy enough. If they do it then the media will ignore it, our national leaders will fabricate a story about how he expired, and all the usual disinformation will kick in. CIA guys know how to accomplish this and it would be a true service to humanity, IMHO. 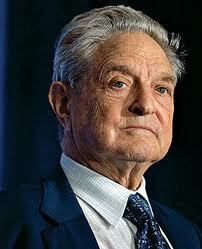 Soros just gave $1 Million to the Obama re-election agenda & another $500,000 to 2 Congressional Super PACs. He wants to run the world via Obie & the United Nations & Agenda 21. Whatever this man does financially on the markets..do the opposite! He has billions to invest in his ultimate goal..to bring down US economy. He’s been quoted several times that his goal is to bring it down. Interesting he’s Obamas biggest contributor.. Hmmmm. He knows people are watching what he invests in and will follow. It’s like leading sheep to slaughter. Like taking candy from a bunch of babies that won’t stand up to their constitutional rights! At least, and the very least.. Ask for a kiss before you bend over! OBVIOUSLY THE UNITED STATES INC. IS VERY INTERESTED IN FABIAN SOCIALISM.